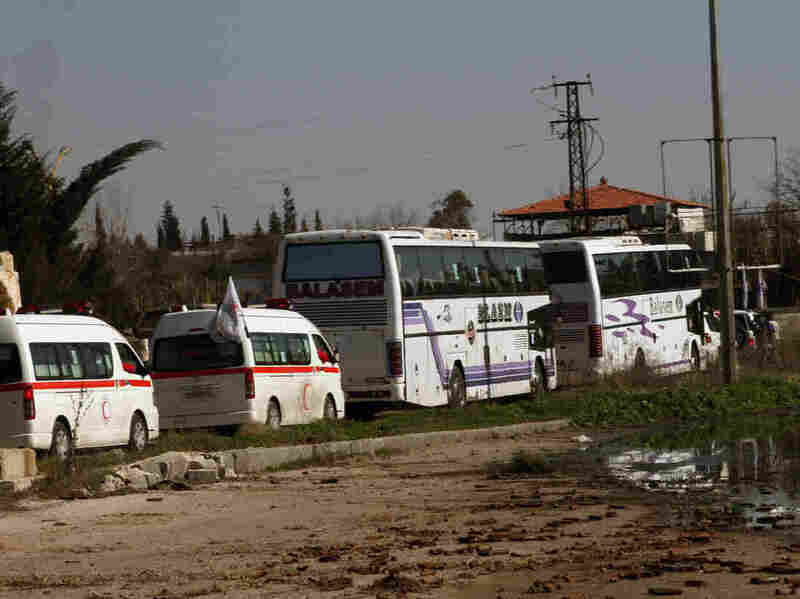 Syrian Official Says 600 Evacuated From Rebel-Held Homs : The Two-Way The refugees were reportedly leaving the besieged city of Homs on the same day that a United Nations aid convoy came under fire. Syrians on two buses followed by the Syrian Arab Red Crescent's vehicles evacuate Syria's battleground city of Homs, on Friday. More than 600 people have left rebel-held areas of the besieged Syrian city of Homs, according to the local governor. Talal Barrazi gave the figure for the number of evacuees as of Sunday evening. "The evacuation is part of a three-day truce that began Friday between the Syrian government of President Bashar Assad and armed rebels to allow hundreds of women, children and elderly men to leave opposition-held parts of Homs, and to permit the entry of food. Forces loyal to Assad have blockaded rebel-held parts of Homs for over a year, causing widespread hunger and suffering among residents. The United Nations mediated the truce. "Earlier Sunday, gunmen opened fire on civilians waiting to be evacuated." "The aid workers are using armoured four-wheel-drive vehicles rather than trucks to carry the supplies." As we reported on Saturday, an aid convoy run by the Syrian Red Crescent said it had been attacked by "armed terrorist groups" and that four people had been wounded.